Being involved in a labour dispute can have drastic effects on your financial health. An extended period without a regular paycheque can decimate savings and possibly lead to increased spending and credit card debt. 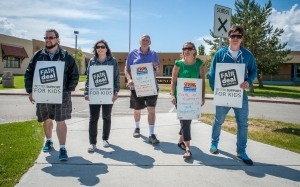 The British Columbia Teacher’s Federation (BCTF) strike is stretching into its third week. Although negotiations continue, no one can forecast when an agreement will be reached. The thousands of teachers taking part in the strike will undoubtedly start to feel some financial pressure if the current situation persists. Make a contingency plan – Teachers need to prepare to be without a paycheque for an extended period of time. Take the time to analyze your current financial situation and project it into the next couple of months. If the strike lasts throughout the summer, will you need to dip into your investments or savings? You also need to think about your debt management – How will you make payments on to your creditors or mortgage lender? Cut back – Now is not the time to make any extravagant purchases, especially if you need to finance it on credit. Make a commitment to saving each time you make a purchase. Whether it’s purchasing a generic brand of cereal or downloading a movie instead of going out to the theatre, each dollar you save will come in handy if the strike continues into the future. In Vancouver, you may want to visit Sunrise Market as it has a reputation as an inexpensive place to get good produce. Get a part-time job – If you are not confident in your financial position, it may be wise to look for another source of income. You may be able to use your skills to pick up some freelance writing jobs (FreelanceWritingJobs.ca is a good place to start), get involved in childcare or tutor students in a variety of subjects. This extra cash infusion will help you to weather the storm until the strike is over. Keep saving after the strike – Whenever the strike ends, and you start receiving a normal paycheque – continue the financially responsible habits you developed while on strike. Put the surplus money to good use by saving it in an emergency fund so that you don’t need to go into debt should your income change in the future.